This project is very easy and takes about 5 minutes to make. 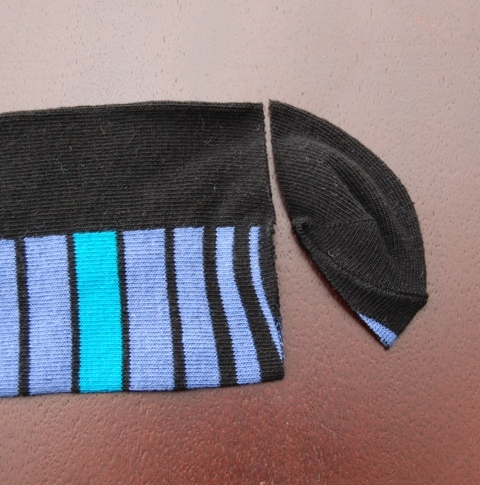 You will need one pair of adult knee high socks and some 6mm elastic (I used clear swimwear elastic but I am absolutely sure that standard braided elastic would work just perfectly). Step 2: Cut along the centre sole of the sock (where it is folded) from where you have cut the toe off to the centre of the heal section as shown. 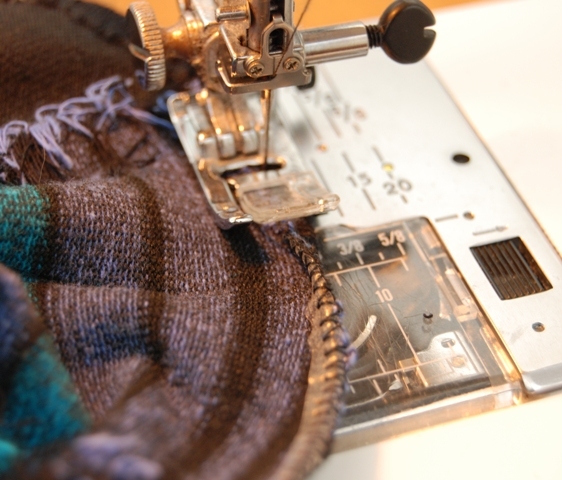 Step 4: Sew (using a zigzag stitch) or overlock around the seam that will become the crotch seam – leave the top (where you cut the toe off) open. Then you should have something that looks like the pic below. Gently stretch the elastic as you sew it on, no a lot, just enough to counteract the sewing machine stretching your fabric out as you sew. 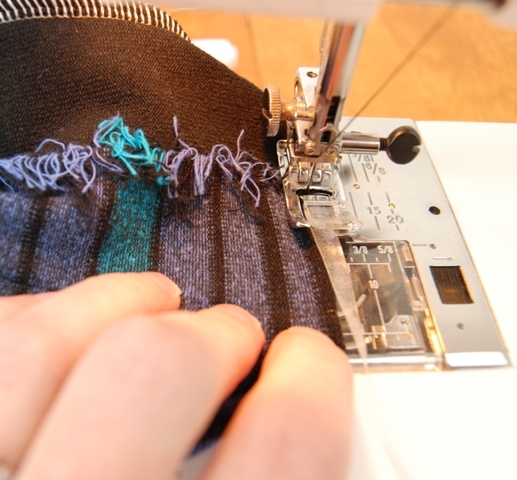 Note: If you are using your overlocker for this part, make sure that the cutting blade is disabled and that you have adjusted the differential feed so that the stitching will still allow the fabric to stretch right out after you have finished. On my overlocker a setting of 1 is considered standard and I used a setting of 0.75. You need to remember to stretch your elastic gently as well, as mentioned above. 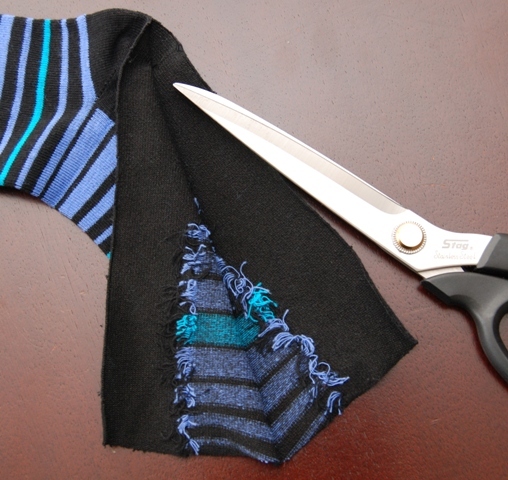 Step 6: Fold the the edge with the elastic sewn to it to the inside and zig zag around the edge. This will create a neat and finished edge as shown. What a great idea! 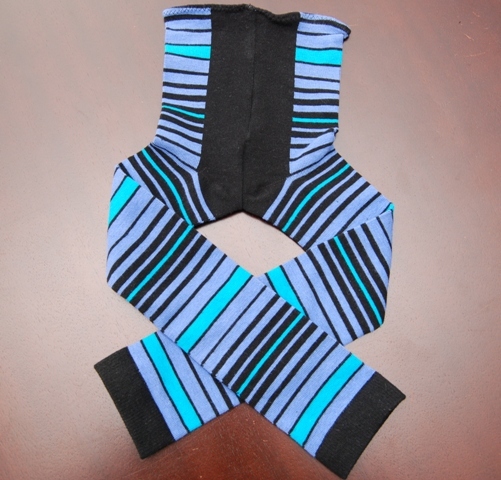 I see those leg warmers in stores up to $12! Insane! Great fashion statement, perfect solution for knee protection, and a bonus of keeping those legs warm and comfy! I can’t believe it. You are so inventive. Thanks for the tute. Thanks for the Tutorial. I love your blog and look forward some new creative tutorials! Thanks so much! Wow! I just made these for my baby girl. I can’t find reasonably priced plain leggings for her. 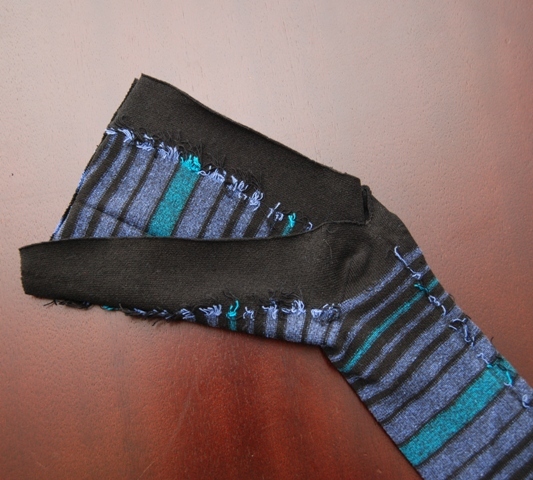 I bought a pair of ladies dress socks for a dollar and these were so simple. This might become addictive, thanks for the great idea! What a great idea! Can’t wait to try this out! I think I’m doing something wrong. every time i try one of the legs ends up inside out. Can you clarify the part about putting one inside the other and sewing? Hi Allicia, this made me smile as I have done this many times myself 🙂 you need to turn one leg inside out then upt the leg that is right way out inside the other one – you should have right sides touching. cool, thanks, As soon as the babies fall asleep I’m going to try again! Thanks 🙂 – post us some pics of your finished product – would love to see! WOW! That’s all I can say. I can’t wait to try this! 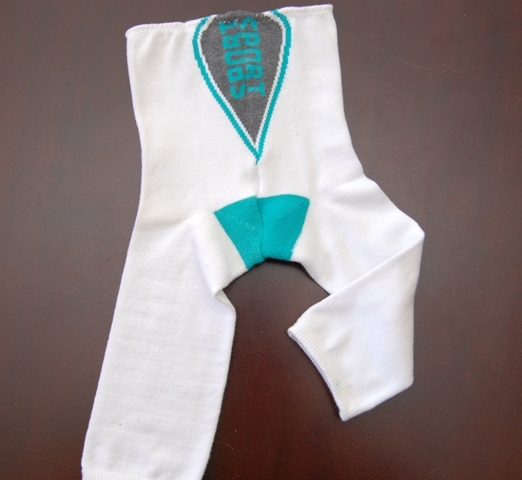 If you made them with largish wool socks, do you think they’d work as a diaper cover? I think this would work really well! Just made three pairs from adorable socks I found on Clearance at Target for $1.75 a pair. Love them! You need to turn one leg inside out then put the leg that is right way out inside the other one – you should have right sides touching. This site make PJ pants the same way – has some pics to look at that might help. These are great! I have bragged about and showed these off like crazy. 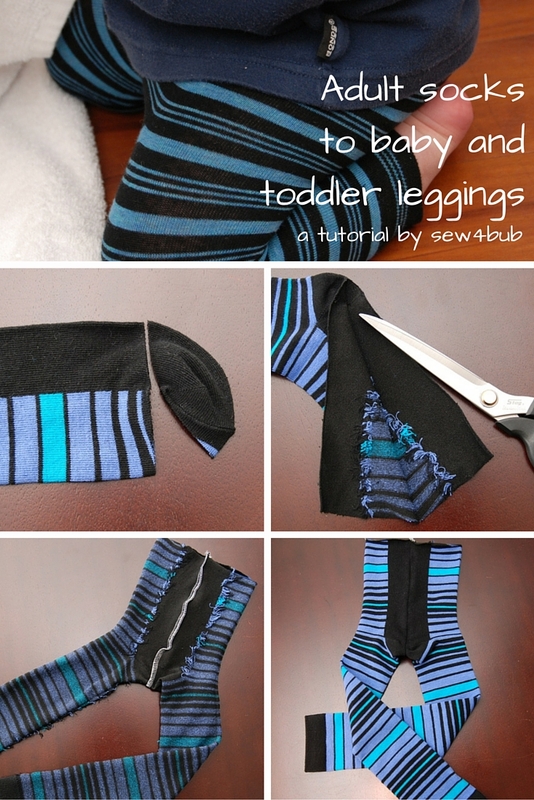 These have been the best DIY item with Baby this winter. 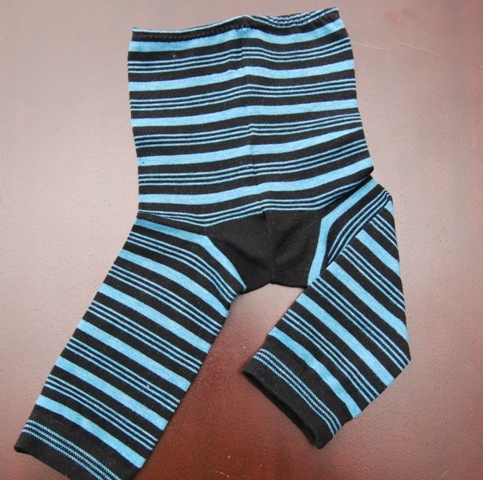 Here’s my site description with a link to your awesome tutorial: http://www.emilylikestomakestuff.com/diy-baby-leggingspants-made-from-adult-socks/ Thank you for posting your how-to. Thanks for the link – your little one is such a cutie, and you are right these are just perfect for crawlers! These are great! Do you know what range of sizes this would work for? My daughter is wearing 3t/4t right now. I am off to find a pair of knee high socks to test this out! Leggings are so expensive. Thanks for the tutorial!! Hi Alecia, since your daughter is likely not wearing nappies at this stage I think they would fit ok (although she may be at the top of the range ) Just make sure you get the largest size socks you can to make sure the rise is long enough or, I have seen people add a stretch fabric waistband (like on yoga pants) for older kids which seems to work really well. Thanks for the advice! I am going to try some now! This is great, wish I found it sooner, my youngest is 5 now, still this is just what i need for their BUILD A BEAR clothes for Christmas. Money is tight so thank you so much for this…I’m not a great sewer but I can do this! If you tag this with dolls clothes diy easy and build a bear and american girl dolls clothes diy you will get more blog guests for sure. can this be made so it is reversible? I love the idea but want a little extra twist. I have known someone to make these, but she said they could only come in NV sizes, any idea what sizes these can all come in? I know it depends on the size of the baby too… but I would want to make them for my 6 month old too. I see your little model is crawling, so I hope making bigger sizes is possible!! 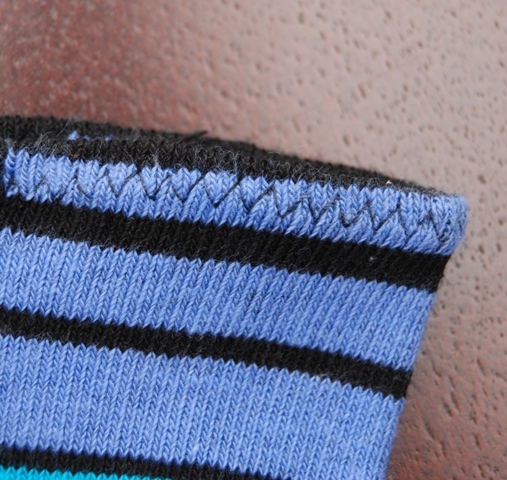 The fit is dependant on the size of the sockd you start with. I think if you used adult sized knee high socks these should easily fit a six month old. How long is your elastic? Hi Laura, It was a while ago that I made these so I don’t know specifically. 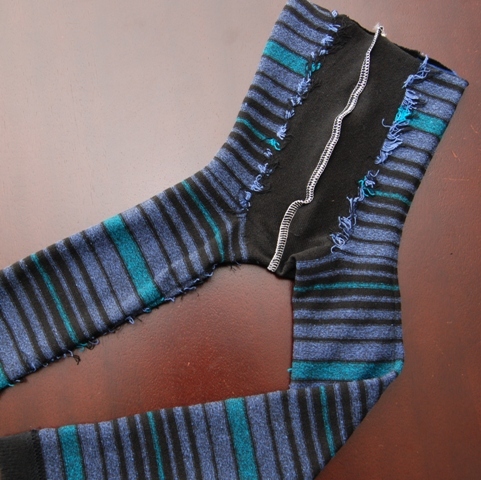 best thing to do is measure around the wearers waist and make the elastic a comfortable fit.